Many items that are used on a daily basis can be damaging to pearls, so it is a good idea to apply items such as hairspray, perfume, lotion, or makeup before putting on your pearls. 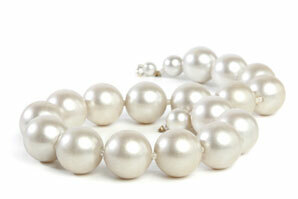 Even the oil on your skin can cause damage over time, so limiting contact to skin may also help preserve your pearls. Due to the delicate nature of pearls, they should be stored separately away from other hard jewelry items. Doing so can help to prevent scratches and other damage. It is best to store them in a cloth lined container, pouch or jewelry box. Proper cleaning is essential in caring for your pearls. After every wearing, gently wipe your pearls with a slightly damp cloth and allow them to air dry. Special pearl cleaner is also available at your local jewelry store. If your pearls are strung on silk make sure you allow them to fully dry before wearing. To prevent your strand of pearls from breaking, it is a good idea to have your pearls restrung periodically. For pearls that see heavy to moderate use, restringing as often as once a year may be advisable. If your pearls are professionally knotted this will help to prevent loss if your strand should break. Knotting also prevents your pearls from rubbing together and causing damage to each other. A little bit of care and maintenance can ensure that your pearls will remain beautiful for years. Whether you need to have your pearls checked, cleaned, or restrung let the professionals at Amoskeag Jewelers help you with all of your pearl needs. Why do I need a medic alert bracelet? In 1963 the American Medical Association designated a special symbol to be used in alerting emergency medical personnel of special medical conditions when a person is unable to communicate for themselves. Almost 50 years after being introduced, medic alert IDs are common and emergency medical personnel are trained to look for them. Medical IDs are designed to carry vital, possibly life saving information engraved upon them. However, many people with medical conditions are not utilizing this possibly lifesaving tool. Who especially should wear a medical alert ID? For those suffering from Alzheimer’s Disease, a medical ID bracelet can also be vital in case they become disoriented or wander away from home. If you or a loved one find yourself in need of a medical alert ID do not hesitate to get one, it could be a matter of life or death someday. 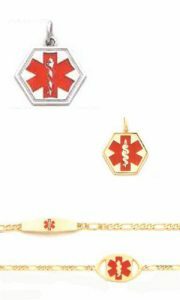 At Amoskeag Jewelers we have an extensive line of medical ID items. Let our trained professionals help guide you through the process of choosing and engraving the best medical ID option for you or your loved ones. When you need to repair a cherished piece of jewelry it can be hard to decide who you can count on. While looking for a jeweler one important consideration is whether or not the repair will be done locally on site. With more jewelry stores outsourcing repair services it can be hard to find a jewelry store that has an on site jeweler. What are some things to consider when deciding if having an on site jeweler matters to you? While many people debate whether or not having a local on site jeweler really matters. 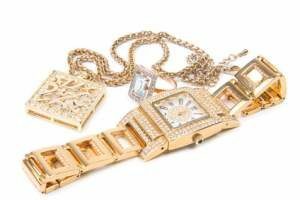 There are many benefits to having an on site jeweler do your repairs. One of the benefits is that your jewelry is kept in one secure location without it being “sent out” to have the repair work done. With your jewelry staying in one location you are less likely to have your item get lost or stolen. You also have the option of speaking with the person doing the work to make sure they clearly understand what you need to have done. 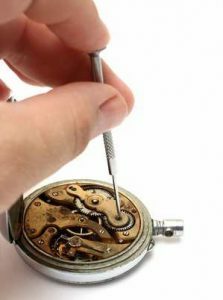 With some minor jewelry repairs this is not necessary but if you are looking to modify an existing piece of jewelry this can be a very important factor. Another benefit is a faster repair time. Many repairs can be completed within a couple of days or while you wait, rather than taking several weeks or as long as a month to repair. These are just some of the many reasons why at Amoskeag Jewelers we always have at least one trained jeweler working to help with all of your repair needs. If you are looking for a local jeweler, come and give the experienced team at Amoskeag Jewelers a try. Estate jewelry can offer a one of a kind look that will set your style apart, without straining your wallet. From contemporary to antique, estate jewelry offers consumers both an excellent value and distinctive styles. However, when shopping for estate jewelry many people wonder what they should consider. Three things to consider when purchasing Estate Jewelry are: condition, craftsmanship and design. (1) Condition – This will influence both the value and the longevity of any item. If you purchase an item for a great price that is in poor condition, over time you may add substantially to the cost with needed repairs or the item may break beyond repair. (2) Craftsmanship – Was the item well constructed, will it continue to stand the ultimate tests of time and use? (3) Design – Overall style is a matter of personal taste. What one person may dismiss as unattractive another person will instantly fall in love with. However, one thing to consider when contemplating the design is how comfortable it will be to wear. Sometimes an item will look great on display but will be uncomfortable to wear. If you love to wear and collect jewelry, with a little consideration estate jewelry may be the perfect choice to expand your collection while saving you money. At Amoskeag Jewelers we are buying everyday and have an extensive collection of estate jewelry that is always changing. So whether you are looking for a distinctive piece of estate jewelry or just looking to sell or trade an item that you no longer want, let the team at Amoskeag Jewelers guide you through the process. 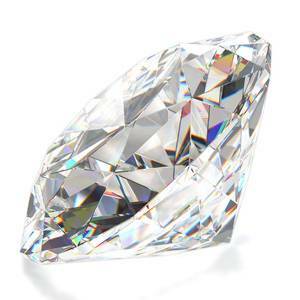 The name diamond comes from an ancient Greek word meaning “unbreakable”. Perhaps that is why for many a diamond is the ultimate symbol for their unbreakable love and commitment. Diamonds are among the most significant and memorable gifts we will ever receive or give. As a result it can be a daunting task to choose the perfect stone. Choosing the perfect stone – Not all diamonds are created equal, therefore diamonds undergo extensive grading. All of the grading that is done for each diamond is summarized with “The Four C’s” of diamonds. “The Four C’s” referrers to: Cut, Color, Clarity and Carat Weight, these are the four main factors that determine the diamonds grade and ultimately it’s value. Understanding “the four C’s” for quality grading is the key to unlocking the internal mystery of a diamond and choosing the perfect stone. Cut refers to the physical cut of the diamond, not the shape. The cut effects the brilliance (the light reflected from a diamond), the fire (dispersion of light into colors of the spectrum) and the scintillation (flashes of light or sparkle when a diamond is tilted). Color is graded by how closely a diamond approaches colorlessness – the less color, the better the grade and the higher the value. (The exception to this is fancy-color diamonds, such as browns and pinks, in fancy color diamonds more color is desirable.) The scale begins with the letter D, representing colorless, and continues with increasing presence of color to the letter Z. Clarity refers to the unique internal inclusions contained in most diamonds. Most of these are invisible without magnification. A clarity grade ranges from flawless to diamonds with obvious inclusions. Most diamonds fall in the middle of these two extremes. Carat Weight: Diamonds, along with other gemstones are weighed in metric carats: one carat is equal to 0.2 grams. In a well proportioned stone the higher the carats, the larger the stone. The helpful staff at Amoskeag Jewelers guide you through the process of weighing all “Four C’s” and choosing the perfect diamond to fit any budget. What is a claddaugh ring? Love, friendship and loyalty. These are the words that best describe the history and lure of the Claddagh ring. From it’s humble beginnings over 300 years ago in a small fishing village in Ireland, to the international symbol for love and friendship. 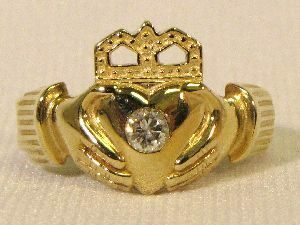 The Claddagh ring stands alone as a tradition unlike any other. Over the years the style of the Claddagh ring has undergone some minor changes but the overall appearance has remained the same. The hands of the ring denote true friendship and togetherness, the heart signifies love despite all odds and the crown stands for loyalty in the face of any adversity. Let the helpful staff at Amoskeag Jewelers guide you through the process of selecting the perfect Claddagh ring to symbolize your love, friendship and loyalty.